Caper…my best girl. That wide-mouthed grin when she looks at me. Mashing her face against my neck when we sleep. That final clang of the gate when we penned the sheep at our first ever AKC herding trial-and were HIGH IN TRIAL! Everything Caper does, she does for me and she does it really well. She is happy to be with me, working with me, whether that is agility, nose work, herding, therapy dog, or simply walking with me and keeping me company. She is the best nurse when I am ill. She loves to roll over and over on the motel bed, making rawr-rawr noises. She does that in the snow, too—grabbing a bite of snow on each side. As she is almost 13 years old now, I feel the insistent pressure of time. 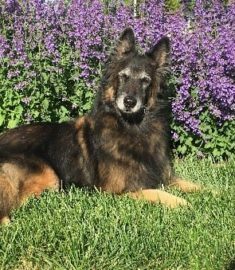 While I will have her children and grandchildren to keep me company for another 10-12 years, the reason I genetically preserved Caper is so that the last dog of my life, her eventual special someday clone, will be a clone of the Best Dog of my life. I love you, Caper Baby—you are the best partner I could have.